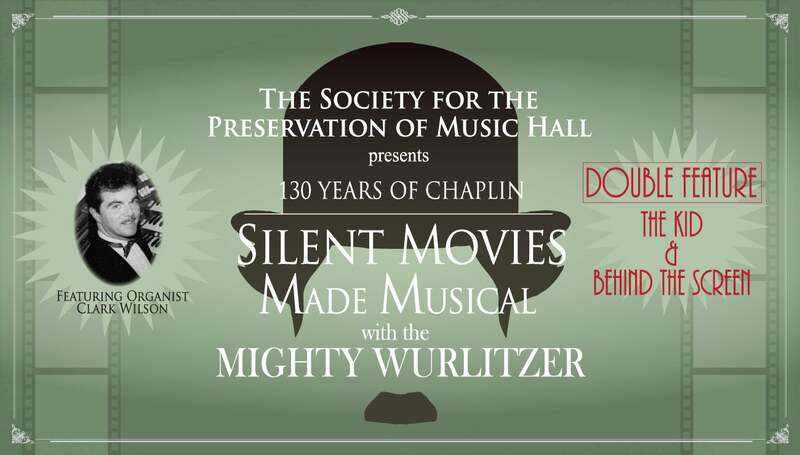 Back by popular demand, The Society for the Preservation of Music Hall (SPMH) presents our popular silent film concert series featuring master organist Clark Wilson mastering the Albee Theatre Mighty Wurlitzer organ in Music Hall Ballroom while screening Charlie Chaplin’s THE KID and BEHIND THE CURTAIN. Charlie Chaplin and Jackie Coogan star in THE KID, widely considered on the greatest films of the silent film era. Chaplin, wrote, produced directed and starred in this 1921 comedy/drama in which Chaplin’s Tramp cares for an abandoned boy whose Mother’s return threatens their relationship. In BEHIND THE SCREEN, Chaplin is an overworked laborer at a film studio who helps a young woman find work even while his coworkers strike against his tyrannical boss. SPMH celebrates 130 years of Charlie Chaplin with our musical moving picture tribute. Born April 16, 1889 in London England, Charles was born to two music hall musicians and was an actor by the age of eight. After his parents' separation, Charlie spent much of his youth in and out of work houses during times of his mother's instability. Chaplin opened a window into his life through his films and found a way to weave comedy into the drama of living. He is an icon of the early Hollywood era of film making and is widely known for his independent films and composing of which he continued for many years. He is survived by nine children and though often remembered for the tiny mustache under his bowler hat, his contributions to the world of film are irrefutable.